Currently, the interest rates on FD are hovering at just under 10%. For R2I-ers, these rates sound excellent as the best rates for Certificate of Deposits (CD) in the US are well under 4%, not to mention the practically non-existent interest rates for savings deposits and checking accounts. Even the interest rates for regular checking accounts in India are between 4 and 6%. Dollar’s status as the world’s reserve currency allows for ready acceptance/convertibility of the dollar all over the world. Many R2I-ers regard themselves as global citizens with plans to travel to and live in different countries. The ready availability of dollar makes this easy. INR on the other hand is yet to be fully convertible and one has to jump through several hoops to convert rupees to other currencies, especially larger amounts. As US stock markets are the most transparent and the best bet when it comes to stock investments, many R2I-ers maintain their stock investments through US market brokerages which deal primarily in dollars. Retirement schemes in the US (IRA/401K) form a sizable portion of assets held by R2I-ers. Withdrawing from such accounts prematurely involves paying a 10% penalty in addition to realizing taxable income and the associated withholding. These factors act as deterrents for R2I-ers. Also, a good portion of the reportable income of R2I-ers may be in dollars (interest, dividends, capital gains, social security/medicare payments, and earned income). In other words earnings are in USD and spending in INR. Combined, these factors leave the majority of R2I-ers vulnerable to risks associated with USD/INR conversion ratio. If INR appreciates, R2I-ers stand to lose and vice-versa. Direction of the INR against the dollar is an unknown – most currency regimes have an unwritten policy of keeping their currencies weak to aid exports. Meanwhile USD is no longer a strong currency because of the fiscal degradation in the US over the last two decades. Many R2I-ers yearn for a strategy that ensures liquidity in INR over the long-term – one that would allow access to INR for ongoing expenses while the bulk of the liquid assets stays invested in USD through their US brokerage and retirement accounts. One tactic is to take advantage of the currently favorable interest rate and exchange rate levels in India and build a liquid INR asset-base: use savings accounts that earn 4-6% for short-term and a set of FDs that earn in the 9-10% range which mature periodically (laddering) for long-term. Decide on setting aside a percentage of the liquid assets in INR. This number will vary depending on one’s outlook – it can be quite high for those planning to spend most of their lifetime in India and vice-versa. Bear in mind when eligible for Social Security, those payments will be coming in USD. A portion of the INR assets should be set aside for short-term needs (say 6-12 months). This money should be invested in regular savings accounts that earn 4-6%. In this example, we set aside 20% for short-term needs for a total of Rs 5L. Construct an FD ladder with the rest of the money to ensure rupee liquidity over the long-term (say 10 years). 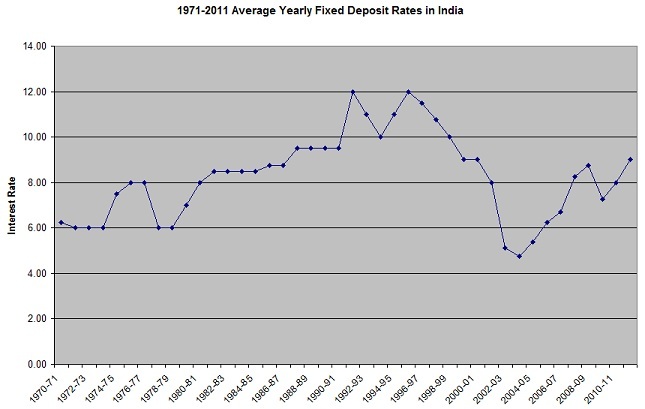 On the average, these deposits should earn between 9-10%. In the example, an FD ladder covering 10 years can be constructed by starting fixed deposits worth Rs 2L each with maturities spanning 1, 2, 3, ..., 10 years. As the FDs mature, the ladder can be continued perpetually by investing in another FD with the proceeds of the matured FD. The maturity of the new FD should be for the highest term (10 years). FD laddering allows the flexibility to determine what to do with portions of one’s money periodically. As long as the FD ladder is intact, there is the flexibility to reallocate the proceeds of the matured FD as you please every year. For example, if interest rate is very low or if the dollar exchange rate is very low, one can do away with the ladder and use the proceeds for current needs. The ladder also allows for assets to be invested in longer-term (10 year) FDs while allowing rupee liquidity without penalties on a periodic (yearly) basis. In an emergency, it is also possible to get access to all the funds invested in FDs: the FDs can be closed and proceeds credited at any time, although there is a penalty that reduces the interest paid. The penalty can vary with banks although the most common penalty is the following: if the interest due for the period was 9%, they will only credit 8% in case of early withdrawal.